[130 Pages] Termite Bait Systems Market categorizes the global market by Application (Commercial & Industrial, Residential, Agriculture & Livestock Farms), Termite Type (Subterranean, Dampwood, Drywood), Station Type (In-Ground, Above-Ground), and Region. 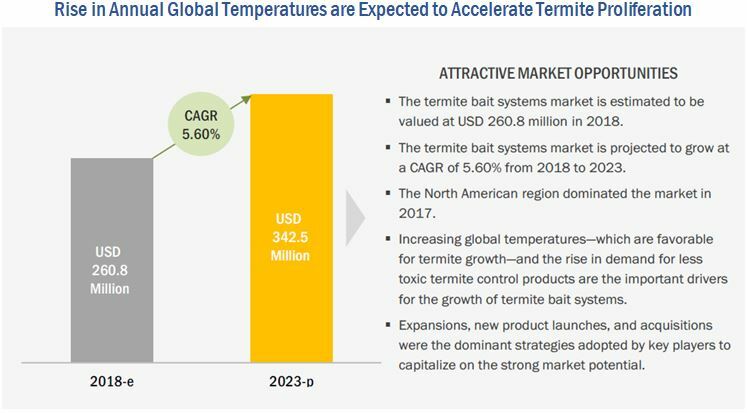 The termite bait systems market is estimated at USD 260.8 million in 2018 and is projected to reach USD 342.5 million by 2023, at a CAGR of 5.60% during the forecast period. The key players have been identified through secondary sources such as Bloomberg, Factiva, agricultural magazines, and companies’ annual reports while their market share in the respective regions has been determined through both, primary and secondary research. 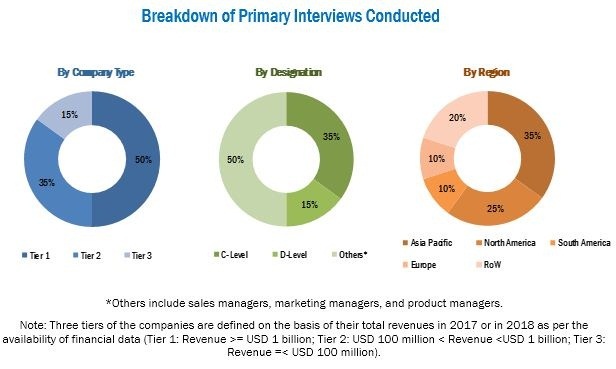 The research methodology includes the study of annual and financial reports of top market players as well as interviews with industry experts (such as CEOs, VPs, directors, and marketing executives) for key insights (both quantitative and qualitative) for the termite bait systems market. The various contributors involved in the value chain of the termite bait systems market include raw material suppliers, R&D institutes, termite bait system manufacturing companies such as DowDuPont (US), BASF (Germany), and Bayer (Germany), and government bodies & regulatory associations such as the US Environmental Protection Agency (US EPA), World Health Organization (WHO), Pest Management Regulatory Agency (PMRA), and Control of Pesticides Regulations (CoPR). There are different methods employed for controlling termite population, such as liquid chemical barriers and baiting stations. Liquid chemical barriers such as repellents are used to create a barrier around and under the buildings to block potential routes of termite entry. However, this method has certain drawbacks, as the barriers can be moved, replaced, or disturbed by pets and children or by adding a new garden bed. These drawbacks are noticed especially in developed countries with low population density and high household area per family. Additionally, the direct application of chemical to the soil is toxic to animal and human health, located in the surrounding area. Thus, it has been a reason for homeowners to prefer bait stations, which are safer to humans and pets. Whereas in developing countries with high population density, chemical barriers are mostly not an option at all. Termites are prevalent in climatic regions with temperatures in the range of 22.9°C (75°F) to 35°C (95°F) for their survival. They would die if the surrounding temperature is below 25°F or above 100°F. Hence, termites are predominantly found in subtropical regions of almost all continents. The changing climatic conditions are of significance for termite control as global warming leads to change in the population dynamics of termites and their ecosystems as they are found prominently in warmer climates. Warmer temperatures associated with climate changes affect the distribution and infestation of termite. Due to climate change, the termite population is expected to move rapidly from mid to high latitudes with higher chances of survival rate. To control the risks of termite infestation, bait systems are expected to provide long-term protection in and around homes, without being affected by the changing climatic conditions such as heavy rainfall or high summer temperatures. In case of bait systems, the cost of installation and bait components is considered along with the cost of the active ingredient. Hence, baiting systems are more expensive as compared to conventional chemical treatments. Additionally, baiting systems require multiple visits to the structure to monitor termite presence and assess in case any additional baits are needed. Awareness about termite bait systems is low in developing regions such as Asia and Sub-Saharan Africa. Homeowners are less aware about the benefits of termite bait systems, and they are accustomed to the methods of usage of chemical liquid barriers, which helps in immediate knockdown of termites. 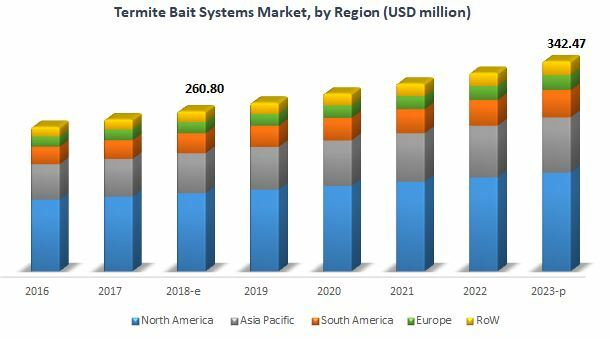 The main reason for the low adoption rate of termite baits in these emerging regions is the established market for chemical termiticides, which are less expensive as compared to baits. This research report categorizes the termite bait systems market based on termite type, station type, application, and region. Further breakdown of the Rest of European market for termite bait systems into Greece, Portugal, and the UK. Further breakdown of others in RoW market for termite bait systems into Israel, Turkey, and Morocco. The termite bait systems market is estimated to be USD 260.8 million in 2018 and is projected to reach USD 342.5 million by 2023, at a CAGR of 5.60%. The environmental benefits associated with termite bait systems are a major factor contributing to the growth of this market, globally. Due to the growing housing market and increasing prevalence of termite population due to the poor building practices, the market for termite bait systems is projected to grow in the coming years. The termite bait systems market is a relatively small sector in the termite control industry; however, the market has been growing at a significant rate due to the increasing need for effective termite management with less toxic methods in different sectors such as commercial and residential, in developed countries. Subterranean termites occur in greater numbers in warm countries in the southern hemisphere. They infest homes from the ground level; it is easier to prevent subterranean termite infestations than drywood termite infestations. The most common control measures for subterranean termite infestations include placing bait stations around the house. Therefore, with respect to termite type, subterranean termites are estimated to dominate the termite bait systems market in 2018. This is due to the strong demand for these products & services in the North American and Asia Pacific regions. The termite bait systems market, in terms of station type, is estimated to be dominated by in-ground bait stations in 2018. The main function of the in-ground station type is to monitor termite activities below the ground level of and around homes and apartments. Since subterranean termite species are predominantly found below the ground, consumers give high preference to in-ground termite bait stations. The convenience in the use of these products is a major reason supporting the acceptance of in-ground bait stations among consumers. In this report, on the basis of application, the market has been segmented into commercial & industrial, residential, agriculture & livestock farms, and others that include forestry, storage, and transport facilities. The commercial & industrial segment is estimated to account for the largest share in 2018. This dominance can be attributed to the need to avoid heavy infrastructure losses from termite damage in the commercial & industrial sector. North America accounted for the largest share in 2017; followed by Asia Pacific, owing to the growing adoption of termite bait systems in countries such as the US, Canada, Australia, and China. Subterranean termites are widespread in North America and responsible for 90% of the management and damage costs in the US. In addition, the use of termite bait systems is high in the residential sector due to the presence of a large number of wooden houses, consumer awareness, and the strong presence & consumer reach of service providers in this region. Thus, the North American region dominated the termite bait systems market in 2017. Factors driving the growth of the termite bait systems market are its environment-friendly nature, convenient application process, and changing climatic conditions that fuel the prevalence of termite attacks. The major factors restraining the growth of the termite bait systems market are the high initial investment, renewal costs for contract maintenance, and lack of awareness. However, the market has strong prospects in the coming years, such as high consumer preference for innovative and sustainable products, and growing market opportunities in urban residential areas. The global market for termite bait systems is dominated by large players such as DowDuPont (US), BASF (Germany), Bayer (Germany), Sumitomo Chemical (Japan), Syngenta (Switzerland), and Rentokil Initial (UK). Some emerging players in the termite bait systems market include Spectrum Brands (US) Ensystex (US), PCT International (Australia), Rollins (US), Terminix International (US), and Arrow Exterminators (US). Every bait system is composed of an active ingredient, which is either an insect growth regulator or chitin development inhibitor. These are a type of insecticides that are non-toxic and environmentally sustainable as they hold the growth of the larvae into an adult stage thereby reducing their chances of reproduction. Thus, there is an opportunity to develop bait systems using compounds that are completely sustainable, and in addition, make use of natural components that would function as attractants for termites. The urban population of the world has grown rapidly from 746 million in 1950 to over 4 billion in 2016, according to United Nations Data. As a result, there has been an upsurge in housing, infrastructure, and hospitality sectors. Termites have been able to adapt to the growing urban establishments due to the usage of termiticide products at higher dosage levels without the introspection of a certified pest control service provider. This has led to increased resistance to chemical products. Customers from residential areas have also been proactive enough to take such preventive measures for structural protection of their households. To maintain public health and hygiene, pest management has been sought as an important tool in the urban cities of developed countries. Higher spending capacity of this demography has also been a factor for affording such services. The drawback of baiting systems is the duration required for termite colony elimination. The effect of baits is slow as compared to the knockdown effects of liquid barriers. After the placement of bait stations, it might take several months for termites to find baits and share it with their nest mates. Also, there might be some degree of termite infestation occurred at some other location before the slow-acting baits come into effect. Hence, this process might take several months to a year for complete elimination of a termite colony. Furthermore, landlords having severe termite infestation around their homes would not prefer this method, as it takes more time. BASF introduced a non-repellent termite control product, Termidor HE, in Japan. With its application to the foundation soil of homes and commercial buildings, it prevents termites from infesting structural materials such as wood. Dow AgroSciences (US) introduced Recruit AG FlexPack termite bait. This product can be used in food manufacturing and food service areas. This launch helped Dow AgroSciences to strengthen its market position in few states of the US. Orkin, a wholly owned subsidiary of Rollins, opened six new franchises in Northeast Brazil, Brasilia, Argentina, Kenya, the Netherlands, and Azerbaijan. This development has expanded the presence of Rollins in South America, Europe, and Africa. Sumitomo Chemical established a new R&D facility in North America to provide unique and innovative solutions based on the two technological disciplines of health and crop science, namely, crop protection chemicals and biorationals. Arrow Exterminators acquired Moore’s Premium Termite and Pest Control LLC (US). This acquisition would facilitate Arrow’s ability to grow and serve more residential and commercial customers with a full line of services in Georgetown, South Carolina. Arrow Exterminators acquired Gary’s Quality Pest Control, Inc. (US). This acquisition would contribute to grow and serve more customers in Southwest Florida with a full line of services, including termite and mosquito services. BASF entered into a commercialization agreement with Mitsui Chemicals Agro, Inc. (MCAG) (Japan). Through this agreement, MCAG granted BASF an exclusive right to commercialize Broflanilide products in several markets worldwide, excluding Japan and certain Asian other countries. Broflanilide is used to control different pests such as caterpillars, beetles, termites, ants, and cockroaches. Bayer and IMBB (Institute of Molecular Biology and Biotechnology) (Greece) entered into a research collaboration for a period of five years. This collaboration is expected to discover the key aspects of insect gut physiology and discover novel targets for the development of insect control solutions. 11.1.4 Sumitomo Chemical Co., Ltd.